SBU - Computer Science Department - February 7 - CS Job & Internship Fair is Set! Home ► About Us ► News ► February 7 - CS Job & Internship Fair is Set! February 7 - CS Job & Internship Fair is Set! 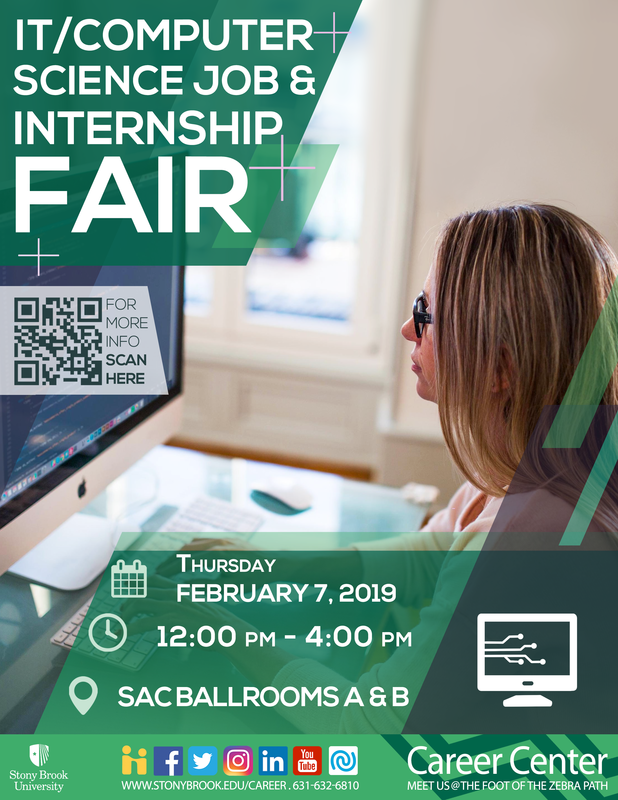 The IT/Computer Science Job and Internship Fair is set for Thursday, February 7, 2019 from 12n-4p. So far close to 70 employers will participate in one of our busiest spring job fairs to date. To meet the demand, the event is held in both ballrooms in the Student Activities Center. Make sure you have a professional attire ready and copies of your resume! Don't forget to ask for business cards at the job fair so you can follow up with thank-you notes! If you are a student please make sure that you have a Handshake account. If you are an employer who wants to recruit computer science and information systems students, please contact the Career Center at Stony Brook for registration details.